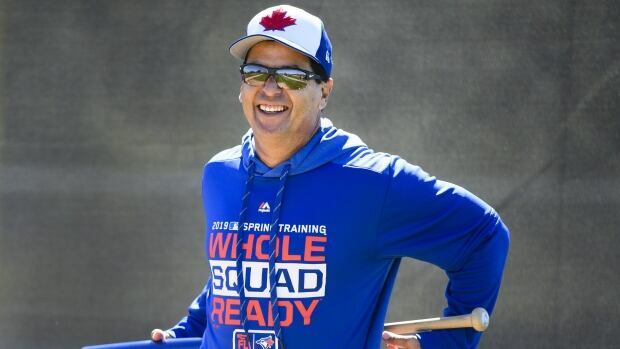 Charlie Montoyo was a 27-year-old infielder still trying to carve out a major league career the last time he stepped on the field at Montreal’s Olympic Stadium. Montoyo, who was drafted by the Brewers twice — in 1986 and 1987 — made his major league debut with the Expos in 1993, appearing in four games with a pair of hits and three runs batted in. But that would be it for his major league playing career. Montoyo sat in a familiar spot in the Olympic Stadium dugout when addressing the media before Monday’s game. It was the same spot he was sitting in when former manager Felipe Alou asked him to pinch hit for his first major league appearance against the Colorado Rockies. The Rockies brought in left-hander Gary Wayne and Montoyo stepped to the plate. He said there were no butterflies in his stomach when he eventually hit the go-ahead RBI single before closer John Wetteland preserved the 4-3 victory. A number of longtime former Expos, including Canadian Larry Walker, Steve Rogers, and former manager Alou were on hand pre-game to be commemorated for the team’s 50th anniversary. Montoyo’s two hits as an Expo didn’t feature in the celebration, however. Earlier Monday, the Blue Jays signed right-handed reliever Daniel Hudson to a one-year, $1.5 million US contract.